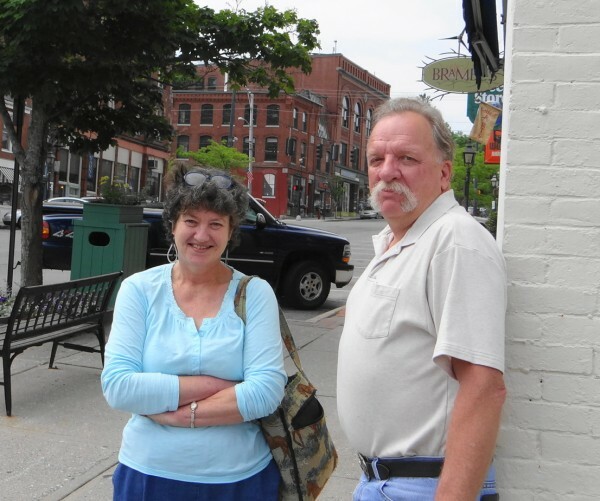 Linda Bucklin and Frank Coombs pose on Lower Main Street in Belfast. The two, with Coombs' wife and Shannon Flood, launched a Facebook page devoted to remembering Belfast and its people in the 1950s through the 1980s. BELFAST, Maine — Though she just stopped at the table to say hello, it was Sheila Dassatt’s comment that summed up what a Belfast-themed Facebook page is all about. Dassatt, an old schoolmate of Frank Coombs and Linda Bucklin, greeted the two as they ate breakfast at Traci’s Diner on Wednesday. She told them their Facebook page, called “You Know You Are From Belfast If…..?,” is “wonderful.” But what she said next explained why over 1,000 people have “liked” the page, and why it shows a steady stream of activity. “Sometimes, I feel like a stranger in my own hometown,” Dassatt said, more wistful than bitter. Coombs and Bucklin met to talk about an event that will move the online community from the virtual world to the real world. They have planned an informal picnic from noon to 5 p.m. at the gazebo in Belfast’s City Park, for those who visit the page and post, and those who are interested in a reunion of sorts, gathering those who grew up in the city in the 1950s through the 1980s. Coombs, 57, launched the page about a year ago. Though he grew up on Bridge Street in Belfast, he and his wife Bobbi now live in Hampden, where he is a firefighter for that town. He remembered hearing his wife laughing as she viewed old photos on a similar Facebook page for her hometown, Fairfield, and decided to launch one for Belfast. Bucklin, 55, who also lived in the Bridge Street neighborhood for a time as a child and knew Coombs, joined in the effort, as did Shannon Flood and Kathy Van Allen. Since then, “it’s snowballed,” Coombs said. There is no administrator or moderator, yet the discussion is mostly cordial. At one point, conversation on the page turned to the infamous Gus Heald, convicted of murdering two sisters in Belfast in 1965. After some sharp comments, others on the page pointed out that some of Heald’s relatives were active on the page as well. For the most part, what drives users are the photographs and newspaper clippings posted on the page. They range from oddly colored Polaroids, postcards and sharp prints made from glass plate negatives to yearbooks, class photos and yellowed clippings from the local newspapers. Royce Tibbetts, a retired insurance agent, is the page’s “go-to” guy for photo identification, Coombs and Bucklin said. In addition to identifying children in class photos who are now approaching 60, page followers solve historic mysteries. A photo of the monument that once sat at the City Park near the long-gone saltwater pool prompted the question, “Where is it now?,” Coombs said. Eventually, someone chimed in that the monument was moved to the American Legion Hall grounds. Both echoed Dassatt’s observation about feeling like strangers in their hometown. Yet with a big smile, Bucklin tells Coombs that she passed an old classmate, “Fudd” — better known today as Brian Horne, owner of Colburn’s Shoe Store, on the way to the diner. Beginning in the early 1970s, the Belfast area was a destination for young adults — whom Coombs referred to as “hippies” — hoping to leave suburban and city life for a more self-sustaining existence in the country. Many started businesses in town and became active in city politics. A second wave followed in the early 1980s, and then in the last 10 years, more retirees have settled in Belfast. Coombs is quick to credit the newcomers for their contributions. “People like Jay Davis got involved with the [Republican] Journal and preserved our history,” he said. Davis and Tim Hughes also wrote the highly regarded “ The History of the City of Belfast in the 20th Century,” Coombs noted. The need to remember the past and keep it alive is strong; even answering a question about where they grew up prompted exchanges between Coombs and Bucklin about local businesses, now gone. Coombs lists the hotels that once flourished — the Phoenix, American, Windsor and Colonial. The two point to one storefront on Lower Main Street where a bar known for fights used to be. Talk then turns to a small Mom-and-Pop grocery store that is now a gallery and another store where furniture, draperies and coffins could be purchased. “Back in the ’60s and ’70s, Belfast was a working man’s town,” Coombs said, and could be a rough place. At the same time, the small town took care of its own. “If you did something wrong as a kid your father knew about it before you got home,” he said. The Facebook page has helped those born and raised in Belfast reconnect, and Coombs and Bucklin are looking forward to meeting those people in person at the June 30 picnic. People are encouraged to bring old photos and yearbooks, along with snacks and beverages — but no alcohol, they stressed.